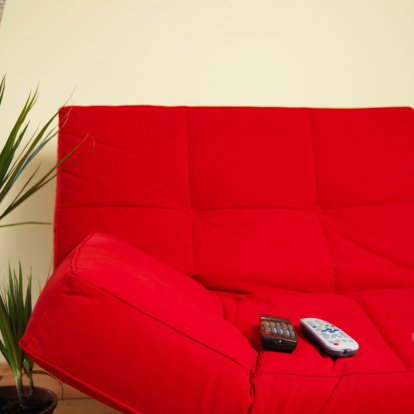 Sofas that convert into beds can be a lifesaver for people with a limited space or budget. Sofa beds provide a place for people to sleep that can also be tucked away and used daily as seating. However, a sofa bed is only useful if it actually works properly. Fortunately, a stuck sofa bed frame can normally be worked loose with a minimal amount of time and effort. A sofa bed can be a good substitute for a guest bedroom. If you can't get the sofa bed out of your sofa, it is a good idea to reread the instructions for the mechanism to make sure you are doing it properly. Sofa beds normally have to be pulled out of the sofa a specific way, and if you are not doing it right, they may not move or they may appear to be stuck. If your sofa is old or the sofa bed has not been used in a long time, there is a chance that the frame is stuck in place due to rust or a general lack of use that has caused the movable parts of the frame to get stuck in place. Spray the joints of the frame with a metal lubricant to loosen the parts of the frame that may be stuck. When you are trying to pull the sofa bed out of the sofa and the frame gets stuck, the first thing you should look for is an obstruction of some kind. Any number of objects, including television remotes, pens, pencils, money and toys, have a way of gravitating through the cushions of your sofa and into the internal mechanism of the bed frame. A pencil wedged in just the wrong location can stop the sofa bed frame from easily sliding out of the sofa. Loose or frayed threads can even stop the sofa bed in its tracks, so check carefully for all possible obstructions. Some manufacturers put a locking mechanism on the sofa bed that will keep the bed from inadvertently popping open during shipping. If this locking mechanism is engaged, you will not be able to open the sofa bed. Contact your sofa bed's manufacturer if you are not sure whether the bed is locked and to find out how to unlock it.